Cute Outfits with Flare Jeans: History always likes to repeat itself in everything and fashion is something that the younger generation wants t constantly experiment with and they like to try the trends of the older generation. Fashion world is constantly replacing newer clothes in volumes and proportions. Fitted dresses with loose ones or the other way round. Such an example is the return of the flared pants. Fitted from the top and flared at the bottom is the trademark of these pants. They sometimes don’t look decent but if accompanied with gorgeous pieces and styled perfectly you can look polished. Denim is a girls must have item, is found in most of the wardrobes and this pant should also be a part of that wardrobe and she should have know how on how to wear it. Just know that you need to be creative with it. Don’t overdo with jewelry and bangles. With this pant your focus should always be on your tops and blazers. A pair of high heels and a bag are a must. You can receive sufficient tips from this article on styling and what shoes to wear with flared pants. Here are 26 amazing ideas to help you figure out what to wear flared pants. White button down with jeans is an all time favorite combination of girls. To add a little funk, wear this pretty gold top on your collared shirty and you are a fashionista. 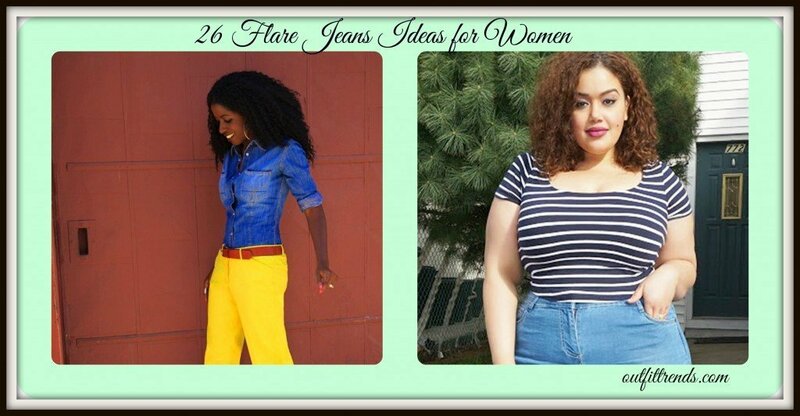 Plus size girls should always keep it very simple with flare jeans. Here this stripped fitted top is working wonders with regular denim. Want to add versatility to your flare jean style. Put on a black blazer over a full black ensemble. You can always add belts with flare jeans. Here this slim brown leather belt is looking very stylish with white contrast. Ponchos are quite versatile. you can pair with with many clothing pieces. Here it is working wel, with the flare jeans in winters. Peplum is a difficult piece to style with. but be a little creative and the end result is just outclass. Keep it very simple for everyday outfit. A gray blazer and jeans paired with a few bracelets. This naval blazaer is looking very nice with otherwise coll outfit. Pay tribute to the decade this pant was originally introduced.